The St. George Serbian Orthodox Church in Carmichaels, Pennsylvania is in the Pittsburgh Deanery of the Eastern American Diocese. Very Reverend Stavrophor Rade Merick is Dean. His Grace Bishop Irinej is the hierarch. 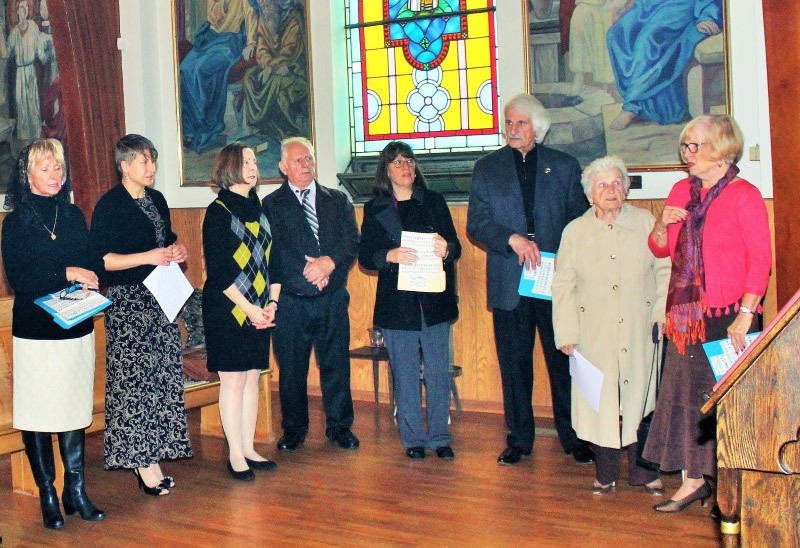 The St. George Choir in Carmichaels, Pennsylvania celebrates the Renovation of the Church of St. George as the Choir Slava. Parish Priest Father Sasha Nedic officiated at the Divine Liturgy on November 16, 2017. The celebration continued on Sunday, November 19 at the Divine Liturgy with blessing of the Slava Kolac’ and Koljivo. Living and departed Choir members were remembered. Dedicated Director Sonia Janson led responses at the Liturgies. Choir members include Andrea Janson, Paulette Radock, Anna Mae Knezovich, Djelosh Milosevich, Mildred Bezjak, Ludwig Mistovich, Milosh Serb Krewasky, Mary Jo Krivitsky and Popadija Rachel Nedic. A dinner and program in the church hall followed the Sunday service. In addition to Director Janson, Parish Executive Board members Stan Brozik, John and Felcia,Williamson, Andrea Janson and Aaron Carson participated. Alfred Ellsworth, Thecla Spens, Josephine and Michael Vuich Jr, Djelosh Milosevich and Milosh Serb Krewasky read from the writings of St. Nikolai of Serbia and from Psalms speaking of singing to the Lord. The St. George Choir faithfully provides responses for Sundays, feast days, weddings, baptisms, funerals and memorial services as well as other services during the year. Choir members are dedicated. They freely and willingly give of their time consistently. Members sing with fullness of heart and dedication to God’s Holy Church. The St. George Choir has been an important part of the parish weekly radio broadcast since 2004. The Choir deeply affects the hearts, minds and souls of individuals blessed to hear the singing. The Choir Slava is a time to remember and give thanks to God for the current and past choir members living and departed. Choir members invest extensively of themselves in the St. George Church. Thank God for St. George Choir Director Sonia Janson and the Choir members. Thank God for their faithfulness and the difference they make in countless lives.